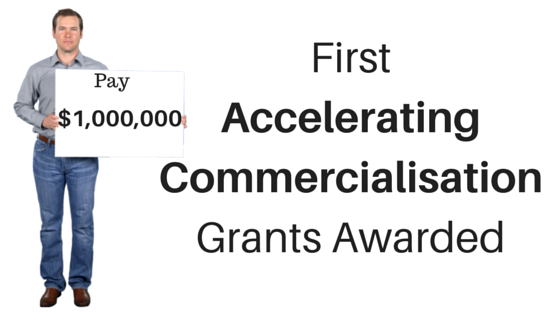 Almost twelve months after the last funding was announced under the now discontinued Commercialisation Australia program, the first grants under the new Accelerating Commercialisation program have been awarded to two ACT companies. The first company to receive funding is MyHealthTest Pty Ltd who has received the maximum grant of $1 Million. Grant funding will be used to commercialise an innovative direct to consumer pathology test analysis and reporting service using home based dry blood spot (DBS) sample collection. MyHealthTest is an Australian company offering a new generation in pathology testing. The MyHealthTest website allows consumers to conveniently order tests and take samples in the privacy of their own home. Samples are then processed by a quality controlled laboratory ensuring the accuracy and reliability of results. A secure on-line portal guarantees the confidentiality of the results delivered to the consumer; results that can be shared with healthcare practitioners, family or others as desired. The second company to receive funding is Interfere X Communications Pty Ltd. The grant funding of $325,000 will be used for radio optimisation trials to commercialise RANifex, an innovative software product for managing radio infrastructure within the wireless mobile broadband market. In March 2015, Interfere X announced that they had received $870,000 from industry investors in addition to an undisclosed amount from ANU Connect Ventures in April 2014. InterfereX develops cutting edge solutions to power the next generation of wireless networks. They hope to revolutionize radio network management by enabling a novel and efficient software platform for maximizing the mobile broadband throughput, while driving down the cost of management. More grants will be announced in the next couple of weeks and will give a clearer indication of the types of projects that will be funded under the new program.